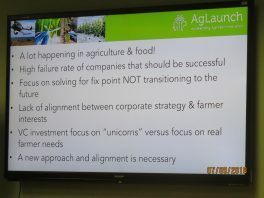 Pete Nelson asked a bold question as he convened the afternoon session on the first day of the weeklong AgLaunch Bootcamp yesterday at the University of Tennessee Research Foundation’s Business Incubator. Nelson, who serves as President and Executive Director of the Memphis-based AgLaunch organization, has teamed with the Knoxville Entrepreneur Center to deliver the appropriately named program for aspiring agriculture-focused start-ups. Seven were selected to participate as noted in this recent teknovation.biz article. “It’s easy in Iowa to build an innovation strategy,” Nelson said. “In Tennessee, it’s hard,” even though he ticked-off a range of Volunteer State assets . . . from good water and soil to the ability to grow major crops and raise a diverse mix of livestock. Like the name implies, those participating in the program will be going through an immersive bootcamp to get themselves better prepared for success. 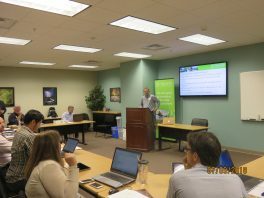 They heard last night from Matt Bell, a Managing Director with Chicago-based Cultivian Sandbox. His firm is focused on helping build next-generation food and agtech companies. In an interview yesterday afternoon, Bell expressed optimism that AgLaunch’s efforts could create what he describes as a “center of gravity” in the agtech sector. That’s partly because of location, partly because of the energy behind AgLaunch, and partly because of a void that exists. Bell noted that Silicon Valley is known for information technology innovation, while Boston is the biotech center for start-ups. There’s no region in the country that can claim that role in agtech. “You have great geographic positioning,” he said, particularly Memphis and its proximity to the Midwest. For a decade, Bell held various technology-related positions at the University of Michigan before joining Cultivian Sandbox in 2013. Much of his time at Michigan was focused on biotech efforts, but he’s clearly studied a variety of successful ecosystems across the country. There’s also the challenge of those focusing on the ag sector having little or no working knowledge about it. “There’s a missing interface between understanding farm operations and how technology can be applied,” Bell said. That disconnect is further exacerbated by a sector that has been slow to adopt new technologies. “When I started doing this, I was told ag was the least data-integrated industrial sector,” Bell said, noting that farmers typically don’t have modern technology like enterprise resource planning tools (ERPs), instead relying on spreadsheets. “Millennials have created a shock to the system” with their emphasis on issues like food quality and sustainability. “We’re on the front edge of a complete digitalization of the system from stem to stern,” Bell believes. Below are several photos from yesterday’s kickoff.